Release Date: February 2nd, 2007 (Angelika Film Center) by Shadow Distribution. The Cast: Connie Nielsen, Damian Lewis, Mido Hamada, John Slattery, Tom McCarthy, Mahmoud El Lozy, Saïd Amadis, Nasser Memarzia. In English and Arabic with subtitles. 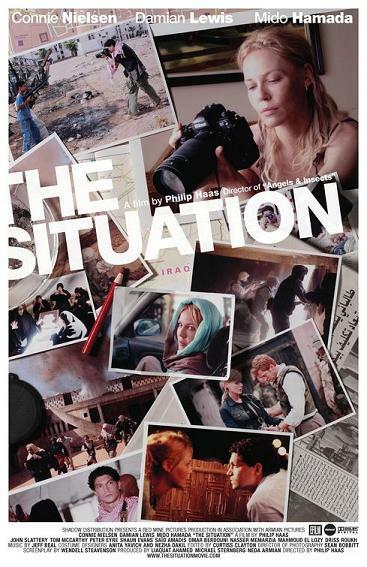 BASIC PREMISE: Anna (Nielson), an American journalist in Iraq, has a love triangle with an American intelligence officer, Dan (Lewis), and Zaid (Hamada), an Iraqi photographer. ENTERTAINMENT VALUE: Unlike Syriana which has a convoluted, confusing plot, The Situation suffers from a dull, minimal plot without enough tension to keep you truly engaged. Both films combine politics with drama and mystery with occasional twists, but neither is particularly intriguing or provocative to watch. Anna’s purpose in Iraq is to investigate the assassination of Rafeeq, an important Iraqi figure who she had once interviewed. This investigation doesn’t really lead to any interesting discoveries throughout the meandering second act which often drags. The screenplay, written by Wendell Steavenson, simply fails to bring any of the characters to life and includes some stilted dialogue. Connie Nielson tries her best to enliven the material as Anna, but she simply doesn’t have enough material to stand out in any scene. On a positive note, director Philip Haas does an admirable job with the cinematography and editing along with impressive of locations in Morroco which adequately doubles for Iraq. These technical achievements aren’t nearly enough to keep you entertained, though. INSULT TO YOUR INTELLIGENCE: Meandering, dull and lacking in tension. IN A NUTSHELL: Impressive cinematography and locations, but often meandering, lacking in tension, and underwhelming.